from 40 pcs. 0,44 EUR ea. from 80 pcs. 0,40 EUR ea. from 160 pcs. 0,36 EUR ea. 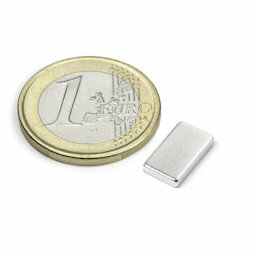 Extra strong, heat-resistant (44H) block magnets (12x7x2 mm). These magnets are often used by builders of model planes who build their own motors. The stronger the magnet, the lighter and smaller the electro motor can be designed. Temperature-resistant up to approx. 120 degrees. Of course you can also use them as regular extra strong attachment magnets. Be careful though when experimenting with them; they easily bread due to their thinness.